"There's one. 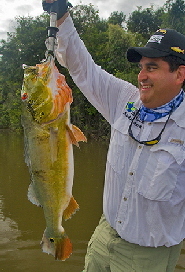 It's a big one," Andres Jara hollered as he set the hook on a fish that had grabbed his one -ounce Daredevil spoon. His rod tip bowed as he struggled to gain control of the peacock bass swimming behind a large rock outcropping in the small protected pocket off the Bita River. The fish moved from one rock boulder to another as Andres carefully watched his line rake along the sharp edges. I tossed a topwater plug behind the rocks and hooked fish and readied for a second strike. "He's on. Double," I noted as a strong peacock exploded on my plug and headed for the bottom. About 3 seconds later, it was off and my plug drifted to the surface. I twitched it a couple more time by the rock and a second fish tore into it. My battle was on. "Oh, it's not that big," Andres admitted when his fish finally swam free of the outcropping and surfaced about 10 feet from our boat. Our guide Jose quickly placed a BogaGrip on the 5 pounder and lifted it aboard as I pressured my peacock of similar proportions toward the boat. "Let's get another double," my partner said as he hooked up with another "paca" peacock on his very next cast. The fish was to the boat, however, before Jose removed the hooks from my fish. My next cast with a hard plastic jerkbait was slammed by another big fish that immediately dove behind one of the giant rocks and broke me off. For the following 30 minutes, Andres and I had strikes on the majority of our casts. We lost several fish, but landed a dozen or more up to 8 pounds. The fish were packed into a 50-foot long section of the pocket off the Bita's main channel, where currents were minimal and the irregular rock outcropping offered baitfish a home. We caught all 3 species of peacock from that spot: the royal, butterfly and speckled. Like most days, our average catch was around 20 peacocks. On a couple of days, we found other concentrations and landed up to 30 fish. While my largest peacock was a 10-pounder from an inner bend sandbar having a sharp drop -off, Andreas caught a 13 ½ pounder in the landlocked Lago Pavon which lies across the river from our Refugio Nimajay Lodge. Andreas, who books the lodge through his International Angling company, has fished the waters several times previously. The same lake produced 30 peacocks for us that day and about the same when I fished it with friend John Fuchs 3 days later. John and I caught several doubles off a rock structure that was located right in the middle of the lagoon. The outcropping came from 30 feet of water up to about 3 foot below the surface and a huge concentration of 4 to 8 pound peacocks enjoyed the haunt. 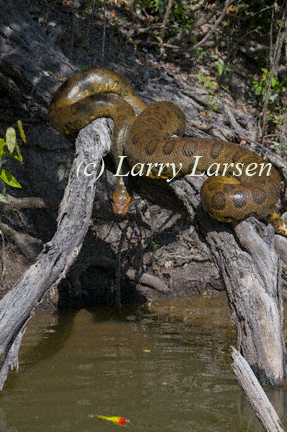 The most significant "catch" was that of the images of a 21-foot-long anaconda that had a girth of approximately 36 inches. We found it napping on a giant fallen tree at the edge of the lagoon. The lodge lies 30 miles west of Puerto Carreño within a national park called Tuparro, which is the country's second largest biosphere reserve. Ricardo Madrinan and his wife Mayra oversee the Refugio Nimajay which is a part of a 5,000 acre ranch that produces cashew nuts. The lodge, which has 2 rooms in each of 2 cabins plus a dining hall, accommodates a maximum capacity of just 8 anglers. It was first developed in 1992 by Madrinan's family but was closed for 10 years between 1997 and 2006 while Madrinan was studying law in Bogota. After returning to the ranch, the 36-year old opened the fishing lodge once again and has built his customer base from about 30 anglers that year to well over 60 in 2011. About 80 percent are from Colombia and many of the rest are from other nearby Latin American countries. A few fishermen from Japan and the U.S. have also visited Refugio Nimajay. The fishing here is seasonal (during dry times), starting around December 15 and ending in mid-April, depending on the weather. 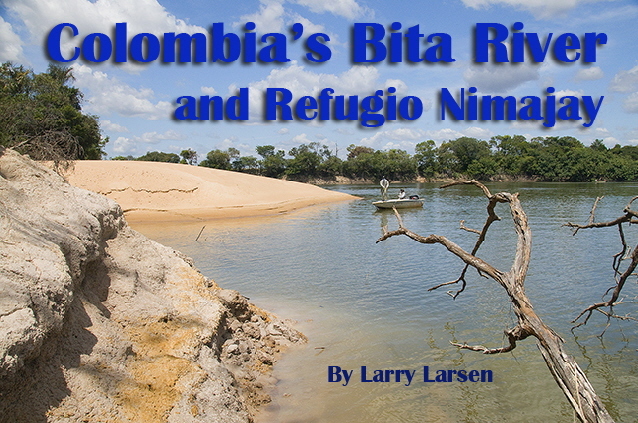 Rains usually begin each year in May and the Bita River varies only by about 5 feet. 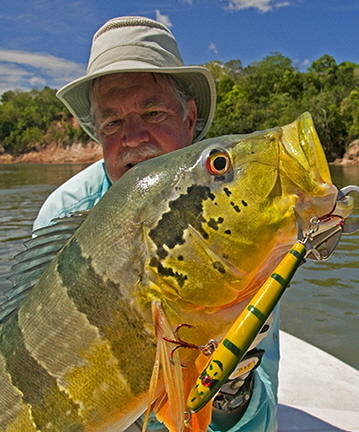 The largest peacock to be caught at the lodge was an 18 pounder but others in the mid-teens are caught each year, according to Madrinan. 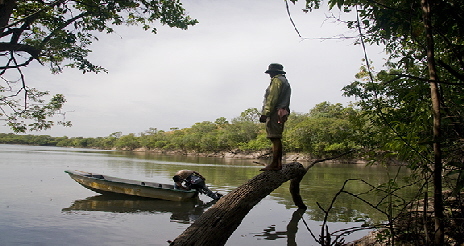 The meandering river and associated lakes yield a variety of other jungle species like payara, jacunda and piranha. 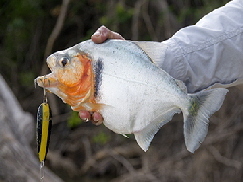 The lodge's record catfish was 22 pounds, top payara was 14 pounds and the best piranha weighed 5 pounds. For more information, contact Andres Jara, International Angling at 1-866-549-3633 or email BitaFishing@msn.com.